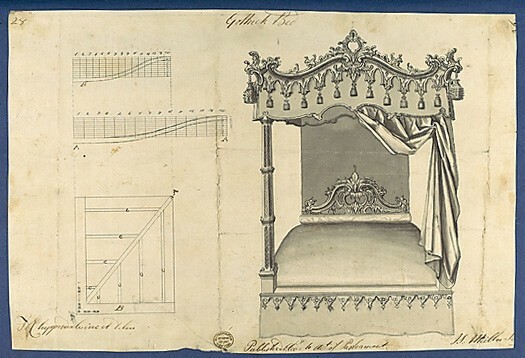 From early 19th century America, when builders and designers were almost incapable of designing an ugly building, a little riff on how design ideas traveled, in this case from the urban centers to the little seaport of Portsmouth New Hampshire. I sometimes just enjoy pondering these things out loud--and find that even 200 years ago in Federalist America, with travel primitive and distances remote, the degrees of separation rarely added up to six. 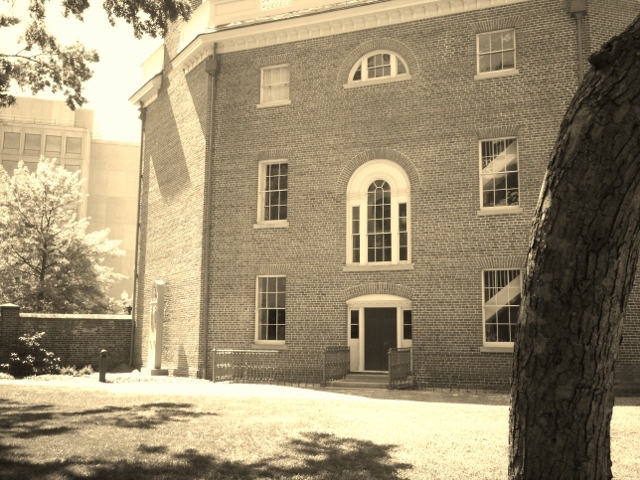 Octagon House in Washington, not really an octagon, designed for John Tayloe by William Thornton, architect of the Capitol and constructed 1798-1800. This was something new in American domestic architecture when first completed. When the White House was burned in the War of 1812, it was to this house that James & Dolley Madison retreated. It is now a museum operated by the American Institute of Architects, whose headquarters behind it so sadly demonstrates how many lessons have been forgotten. 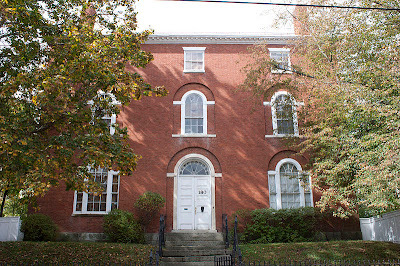 The Thomas Haven house, Portsmouth New Hampsire, built in 1813 on the corner of Middle St. & Richards Avenue in Porsmouth, New Hampshire. It was later owned by Admiral George Washington Storer, who as a five month old baby had sat in George Washington's lap in 1783. Apparently the designer, whose name is lost to history, was familiar with Octagon house. Storer's daughter Mabel married the grandson of Stephan Decatur, a hero of the War of 1812, whose Washington house was designed by Benjamin Latrobe. Sadly the Haven house was long ago demolished by another Storer daughter in favor of a ponderous Second Empire mansion. The Burd Mansion, on Chestnut St. in Philadelphia is thought to have inspired the Larkin house in Portsmouth. 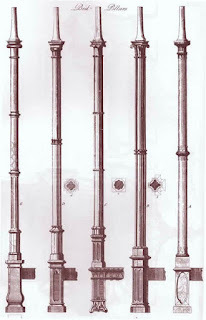 It was designed in 1801 by Benjamin Latrobe. 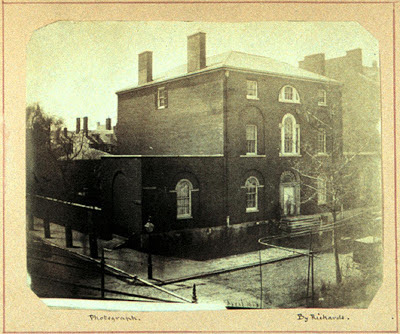 This daguerreotype by Frederic deBourg Richards in the collection of the Library Company of Philadelphia, bears this description: "Mansion of Joseph Sims, Esq. 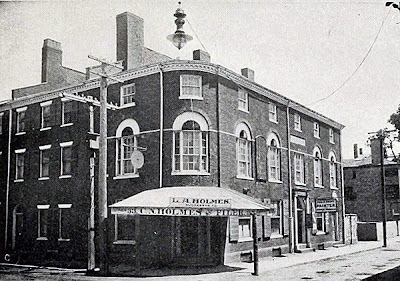 On Southwest corner of Chestnut and Ninth street-the grounds extending to George, now Sansom street, on which latter it has a frontage, with stables, equal to that on Chestnut Street. After the failure in business of Mr. Sims, it was occupied for many years, until his decease, by Mr. Sims' son-in-law, and family, Edward P. Burd, Esq. Mrs. Burd, his widow, still resides there." The Burd mansion is long lost. 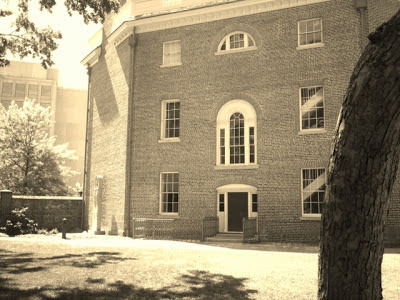 In 1803, Thomas Jefferson appointed Latrobe, America's first professional architect, as Surveyor of Public Buildings in the United States. 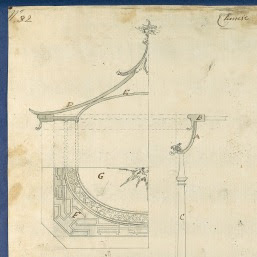 As such, he took over the construction and design of the Capitol, with some irritation at being instructed by Jefferson to follow the designs made by William Thornton, which he found faulty. 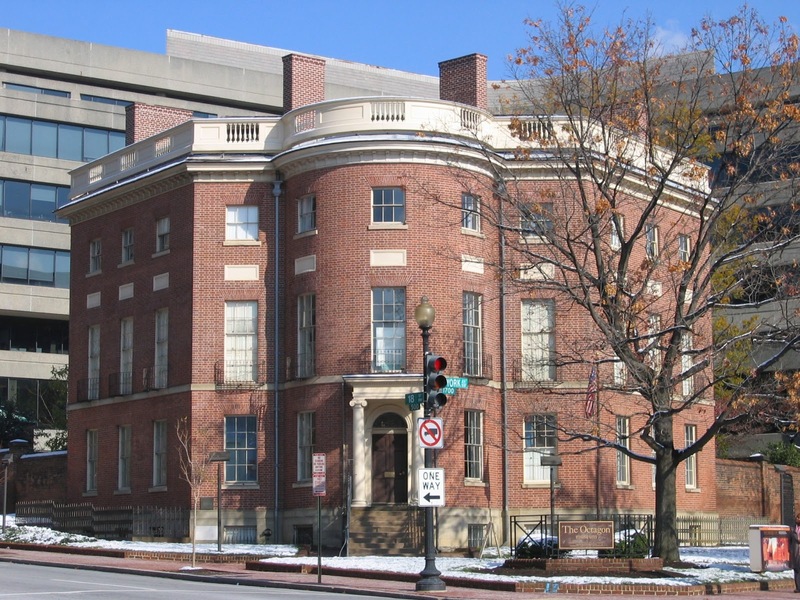 Despite their aesthetic and engineering differences on the Capitol, Thornton's rear elevation at Octagon House and the facade of the Burd house have more than a whiff of common themes. 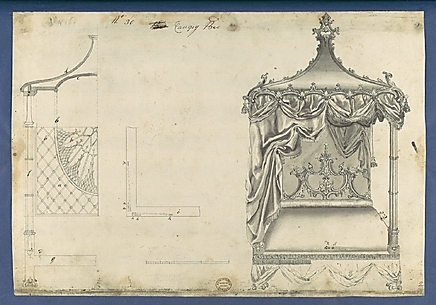 Sheraton, along with his near contemporary Thomas Hepplewhite, and the earlier Thomas Chippendale, was one of the three great furniture designers (four, if one counts the architect Robert Adam, who often had Chippendale execute his designs), and like the others, spread his style and fame by publishing pattern books that could be used by other cabinetmakers. 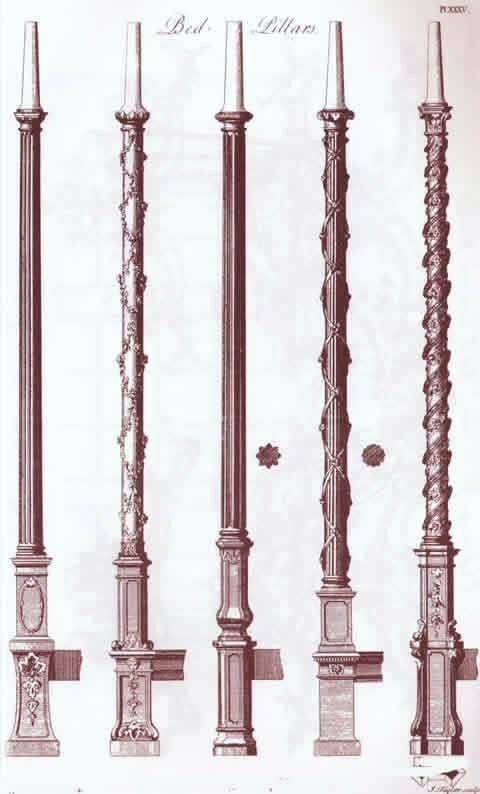 Just as with the architectural pattern books of the era, like Asher Benjamin's American Builder's Companion, these books provided suggested designs, often with mix or match options, along with rules for achieving correct proportions, that helped many a provincial cabinetmaker turn out pieces of compelling beauty, rarely making a wrong move. 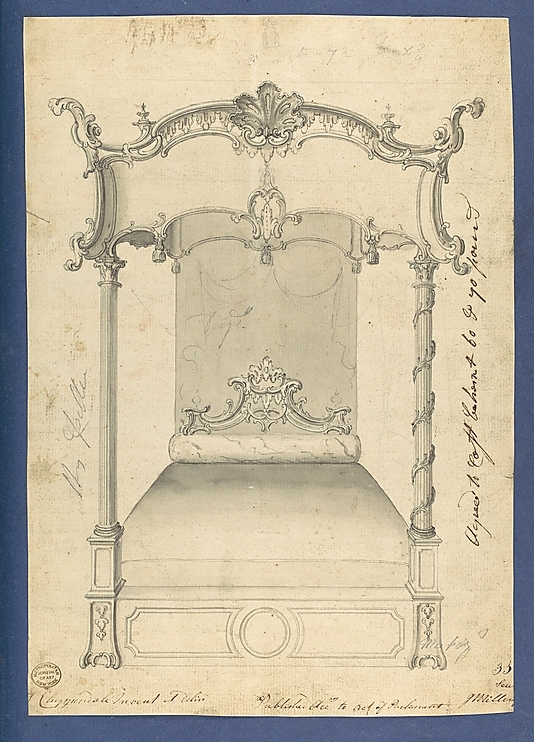 The Yawkey bed does not appear to be antique in the photos, but rather a decorator's inspiration carried out by a talented cabinetmaker. 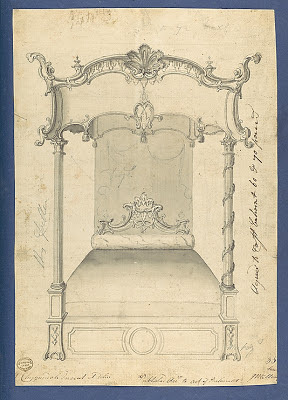 Rather than the neo-classical design of Sheraton's bed, the rococco cornice details are earlier, and more Chippendale in inspiration. as seen in the plates above from Thomas Chippendales The Cabinetmaker's Directory. 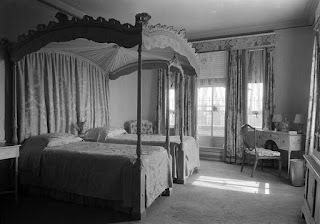 Readers may remember the Chinoiserie bedroom in 'Huntland', the Joseph Thomas house in Virginia, with its dramatic bed later owned by Doris Duke, the design taken directly from plates in Chippendale's Directory. NOTE: January 24th marks Edith Wharton's birthday. This piece was originally published a year ago in 'New York Social Diary' to commemorate the 150th anniversary of her birth. Significant events of Edith Wharton's early life played out in Bar Harbor, and naturally those of us who are partisans of this part of Maine speculate about what would have happened had it been Maine, rather than Lenox, where Wharton chose to live after departing Newport. For all we know, Ethan Frome might have been a Lobsterman, and under the influence of the good clean Maine air, Lily Bart might have married a college professor who summered in Northeast Harbor, and lived happily ever after. In 1880, the future Mrs. Wharton's older brother Frederic Jones and his wife Mary Cadwalader were putting the finishing touches on Reef Point, their new summer house on the Shore Path in Bar Harbor. Their architects were a leading Boston firm, Rotch & Tilden, who designed a number of Bar Harbor's grander estates. That same summer, the senior Joneses and young Edith forsook their usual Newport season, spending it instead at Bar Harbor. Accompanying them was Harry Leyden Stevens, the son of social parvenu Mrs. Paran Stevens. Harry Stevens was rumored to be engaged to Edith, although friends, who called him her 'shadow', felt the romance would not last. The Shore Path, like the Cliff Walk at Newport, traversed between the ocean and large estates, a favorite destination for late afternoon walks. 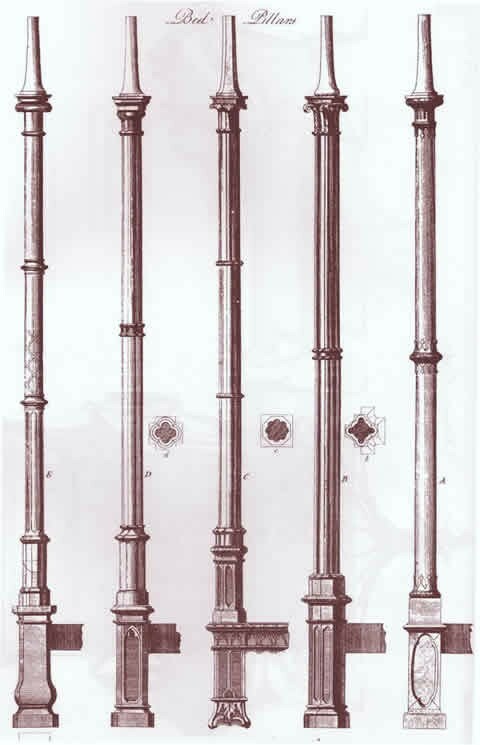 The Jones spent the next two summers in Europe, where it was hoped that the climate would prove beneficial to Mr. Jones' health. It did not, and he died there in March of 1882. Returning to Newport, Edith Jones' engagement to Harry Stevens was officially announced, and nearly as soon ended, apparently due his mother's interference (on this score, Wharton would later exact her revenge by using Mrs. Stevens as the model for the comic Mrs. Lemuel Struthers, the arriviste widow of a shoe polish manufacturer, in The Age of Innocence). In 1883, Lucretia Rhinelander Jones, wishing to put the sad event behind them, took Edith once again to Bar Harbor. That July in Maine, two of the defining relationships of Edith Jones' future life were begun. Bar Harbor was reaching its stride as a major stop on Society's summer rounds, as the anti-Newport, (relatively) simpler, (relatively) less formal, with healthy emphasis on outdoor activities. With less rigid chaperoning of young people, it was considered an ideal spot for romance. 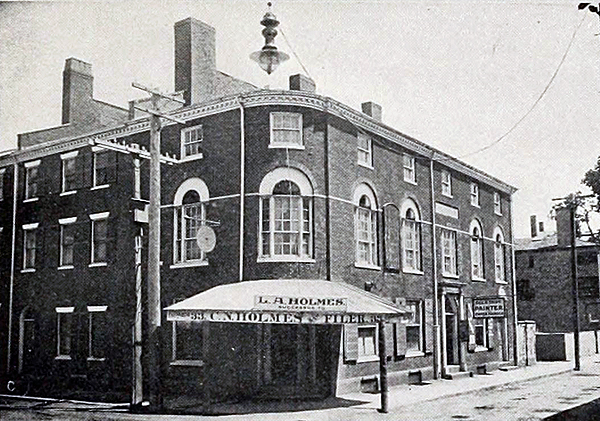 This is the Rodick Hotel, newly enlarged to 400 rooms in 1881, as it appeared when Walter Berry stayed there. 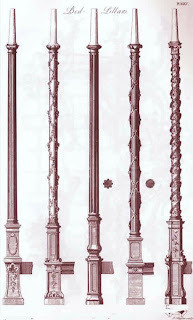 Its 500-foot wooden veranda was a favorite spot for flirtation and gossip. Recreational pastimes included dances at the big hotels, notably Rodick's, where the huge lobby was known as 'The Fish Bowl", hiking on the mountain trails, and canoeing in the bay. It was against this idyllic backdrop that Edith met and fell in with Walter Berry, a well connected young lawyer and budding aesthete staying that summer at the Rodick Hotel, whom she would later refer to as 'the great love of my life'. And then, later, in the little cottage Newport, I wondered why I hadn't — for it would have been good, — and the slices of years slid by. Well, my dear, I've never 'wondered' about anyone else, and there wouldn't be much of me if you were cut out of it. Forty years of it is you, dear. A young couple canoeing, illustration from 'Bar Harbor Days' by Mrs. F. Burton Harrison 1886. Berry's tennis holiday came to an end, and the friendship begun in Bar Harbor was apparently not picked up again until the 1890s in Newport, but no matter, for on the scene appeared an old friend of Edith's older brother Harry, Edward Wharton of Boston, a 33-year-old gentleman of leisure. Though he had known Edith since childhood, it was that summer at Bar Harbor that he began to pay her court, and two years later they were married. Only by chance of timing did another of Mrs. Wharton's great friendships not receive its initial spark. Only days after the Joneses left Bar Harbor that summer, Henry James arrived for a visit. That friendship instead would have to wait until the latter part of the decade to begin. By 1898, Wharton was a published writer, suffering suffering from bronchial complaints and at odds with her editors over publication of some short stories, She and and Teddy, feeling an escape from the dampness of Newport might help, went up to Bar Harbor for a change of scenery, visiting her former sister-in-law, now divorced from Frederic Jones. To supplement her reduced income, Minnie Jones was managing Henry James' literary affairs in the States (and would soon become Edith's agent also). 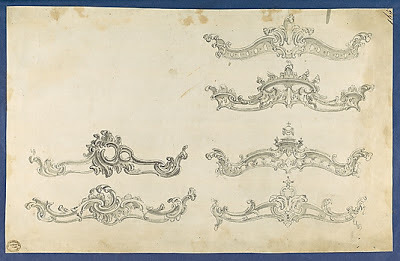 Wharton's niece Beatrix, later Mrs. Max Farrand, was embarked on her own career as a landscape designer. Though the weather was not always reliable (the very definition of a Maine summer — leaving damp Newport for Maine would be analogous to carrying coals to Newcastle), Wharton recovered from her ailments. While on Mount Desert, the Whartons visited Teddy's cousin Mrs. James Terry Gardiner, whose cottage was to Edith an 'ideal of a country place', inspiring her desire to have a place away from the seashore, which would culminate in the purchase of a farm overlooking Laurel Lake at Lenox, where she would build 'The Mount' (the classical style of which bore little resemblance to the plain shingle style of the Gardiner house she had previously found so ideal). Within a few years of course, Wharton the renowned novelist, would give up America entirely and remove herself to France. Although she remained devotedly close to Mary Jones and Beatrix Jones Farrand, her closest relatives, Wharton did not again visit Bar Harbor, although over the more than one of her fictional characters were sent to that "remote island off the coast of Maine" in the course of their navigation through the ever perilous Social waters. 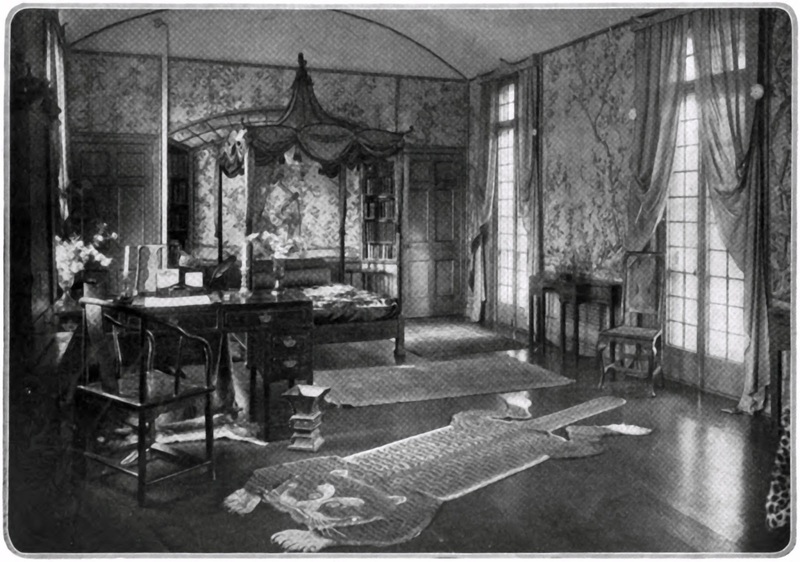 Edith Wharton's Bedroom at the Pavilion Colombe, her house near Paris, as painted by Walter Gay in 1926. In July, novelist Roxanna Robinson also covered this topic in a lecture at College of the Atlantic in Bar Harbor. For many of the details in this piece, I am indebted to the works of Wharton's many excellent biographers – R.W.B. Lewis, Hermione Lee, Louis Auchincloss, Shari Benstock, and Eleanor Dwight (who herself summered on the Shore Path in Bar Harbor). 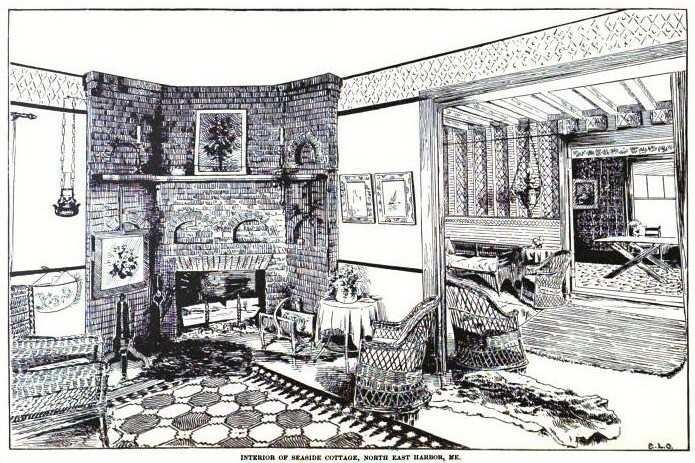 Thanks to Willie Granston for pointing me to the interior view of the Gardiner cottage. 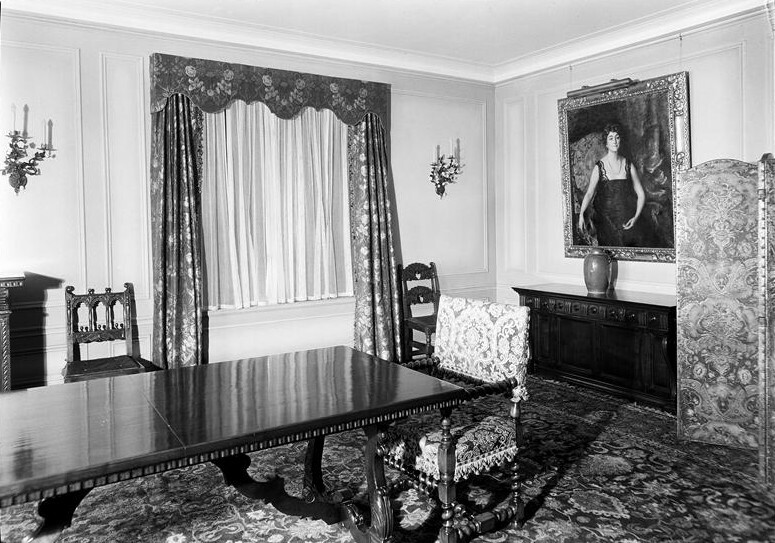 Anyway, getting to the point, I was wandering through the Gottscho Schliesner archives on the Museum of the City of New York website, when I came across a couple of photos of Tom Yawkey's New York apartment, at 992 Fifth Avenue, taken in 1935. I vaguely remembered Yawkey as having something to do with baseball---and a quick trip to Wikipedia later, found that he was a mid-western lumber heir who realized his big dream---to own a baseball team, no matter what it cost him, which over the years was apparently a lot---at very least enough to finance several ballet companies, a new opera at the Met, and perhaps the restoration of the entire downtown of a dying city, or send thousands of underprivileged kids to college.. One thing certain from the pictures, is that the money wasn't spent on the decor. His dining room, with its stolid portrait, of Mother Yawkey, no doubt, and its very ordinary Grand Rapids dining room furniture in the Hispano-Tudorbethan vein, certainly lacks the chic or glamor one associates with fine New York apartments of the era. 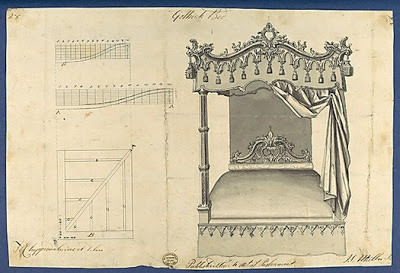 No, what caught my attention was the bed in the master bedroom---an astounding pale confection of two twins beds, joined by an archway under a vast floating canopy inspired by the works of Mr. Chippendale. Quite something, no? Just what does that gate symbolize? Stubbornly lodged in the back of my overstuffed brain, I know somethign else about this design---or at least it reminds me of something---but it isn't coming to me. 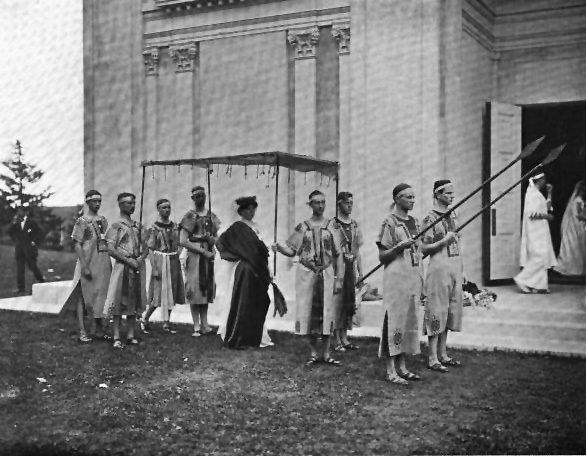 In the early 1900s, when Bar Harbor socialites were not busy evoking Marie Antoinette's France or Gainsborough's England, they channeled ancient Greece. 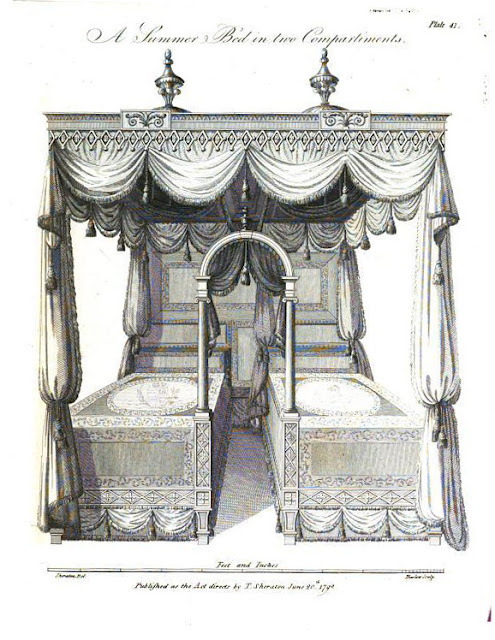 The Dilettante tells you why in today's New York Social Diary.